You may not well learn about PCB soldering, here we outline what is printed circuit board soldering for your reference. Soldering is the process of using a variety of fusible alloys (solder) to connect the metal parts. The melting point of the solder is lower than that of the material being welded, so that components are soldered without melting and then sticking to the board surface by the combination of molecules. 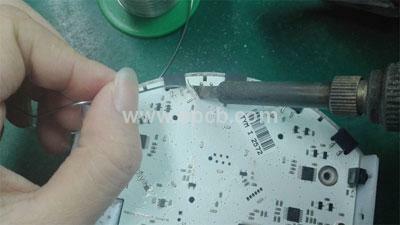 Soldering can be divided into soft soldering and hard soldering. The temperature of soft soldering is below 450℃, while the hard one is higher than 450℃. Hard soldering is usually used for silver, gold, steel, copper and other metals, whose soldering point is much stronger than the soft one, and its shear strength is 20-30 times than the soft one. Soldering ensures the continuity of the metal. Its soldering point does not make components move, and the contact surface won’t be oxidized. Soldering is the process of fusion between two metals. When solder is under the molten state, metal which have touch with it will be dissolved a little, at the same time, the oxidation film will be created on the surface of soldered metal. Because the oxidation film cannot be dissolved, so soldering flux will be used to solve this problem. Cool it down and finish the melting the metal and solder.